★★★★☆ I purchased this for my almost 3 year old son. We are starting to teach him his basics and this looked really interesting. The pegs are a nice larger peg and made well that fits well in his hands. They easily stack on each other. I also love the bright colors as they catch his attention easily.They come with a rubber pegboard which has both pros and cons. The pro is it is lightweight and easy for the toddler to hold. The con is I am afraid with time it will start to fall apart. I do with the board was self-standing or had some type of legs as it is hard for a child to hold it and insert the pegs at the same time.It also comes with boards to go on the pegboard. I wish they would attach someway instead of just sitting there as that is tough for a toddler alone. 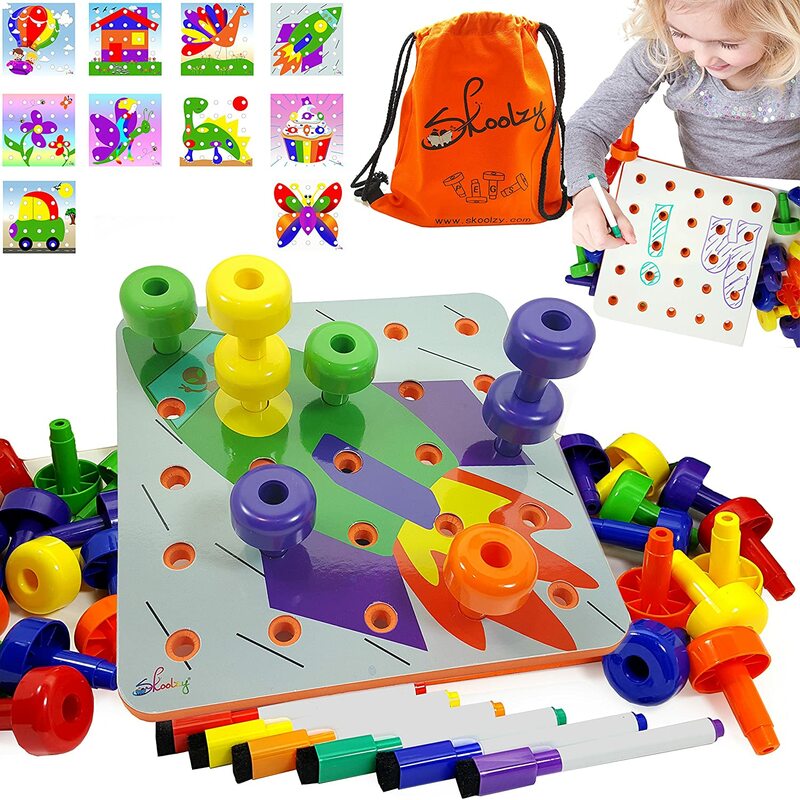 The toy does require a lot of adult assistance in order to play.It is great for teaching a child and allowing them to use their hand and eye coordination along with motor skills. I think with a few improvements though this could be spectacular. ★★★★☆ Overall, I'm very satisfied with this. It's a fun little activity my toddler will enjoy while he sits through church. However, there were a few downsides:-The bag doesn't have any pockets, so all the markers, pegs, and boards are thrown in together.-The boards don't lay flat; they are a little warped.-The pegs aren't designed to be pushed all the way through the holes. Doing this will widen the holes and make the pegs not fit in correctly, but because it's possible, I am concerned my child will force them through, damaging the product. It's too easy to do. ★★★★★ I got this toy for my 3 year-old son who is in the process of being diagnosed with ASD. He loves pushing the pegs into the board and choosing the colors that correspond to the pictures. I love that the toy comes in a bright (easy to find) orange drawstring pouch that makes clean up and transportation a cinch 😉 The pegboard comes with lots of images, colorful pegs, and a whole set of dry-erase markers for creating your own pictures to incorporate the pegs into. This is a must-buy for any child - delayed or not. My 4.5 year-old loves it as well, and it's been helpful in talking about shapes and colors to get him ready for kindergarten. ★★★★★ I ordered this product in hopes of getting my son off of SpiderMan for a while. He played with this for a few HOURS as soon as we opened it, not just minutes. The peg sizes are perfect for his little fingers. The use of primary colors is brilliant as he's only in daycare at the moment (2.9mths old). This is educational and motivational. Ive noticed he's an "i cant get it" type of kid but the pegs are easy to put in and remove. Oh and the bag is a plus as well. He tried to put it in the car instead of his backpack this morning. I will definently look into more Skoolzy products for Christmas. ★★☆☆☆ I have to say that I am pretty disappointed with this product. The concept is great and I was very excited to order this for my three-year-old but the pegs are so chunky that when you put them in you cannot see what the picture actually is. Also the background is left blank I think, as there are not enough pegs to fill them in. So you are left with a bunch of holes in the picture and the picture itself is unclear. He was bored with it within minutes. And he is usually a kid who will sit and work on things for a while.